Too Small, Too Elaborate or Just Right? From its opening on the 10th of March 1928 until the opening of the Canberra Theatre Centre in 1965, the Albert Hall was Canberra’s primary entertainment centre, hosting all manner of events both festive and ceremonial. It remains a much-loved feature of the Canberra landscape. A set of plans for proposed extensions to the Hall, which never quite made it to reality, form this month’s ArchivesACT Find of the Month. It seems that discussions on the expansion of the Albert Hall began almost as soon as the Hall was opened. By 1939 the newly established National Capital Planning and Development Committee (NCPDC) was investigating in earnest possible modifications to the Albert Hall. 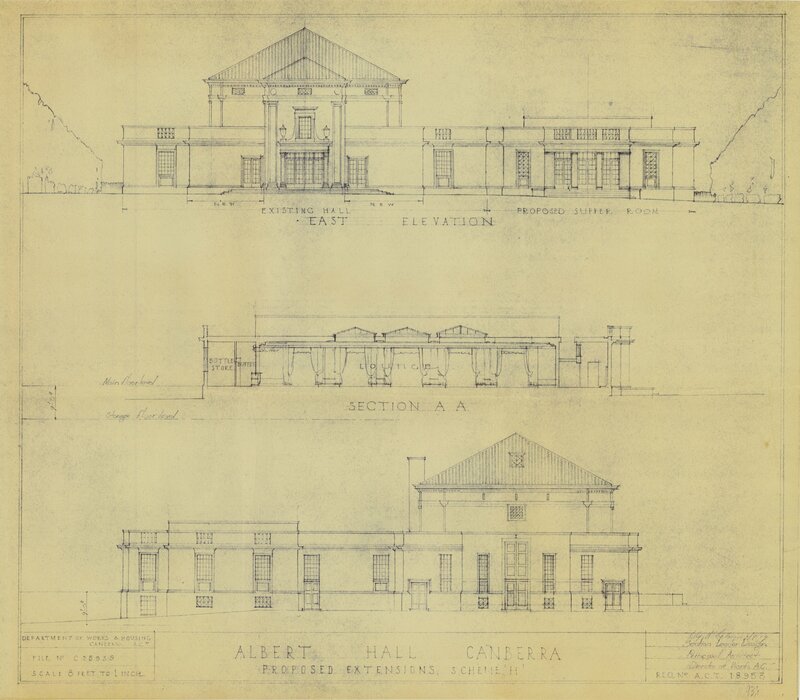 The Committee’s minutes from only its fourth meeting note that: "the Committee concurs in the general proposal for alterations and additions to the Albert Hall as submitted and suggests that consideration be given to the provision of an adequate heating system and to the removal of the electric sub-station from the precincts of the building." 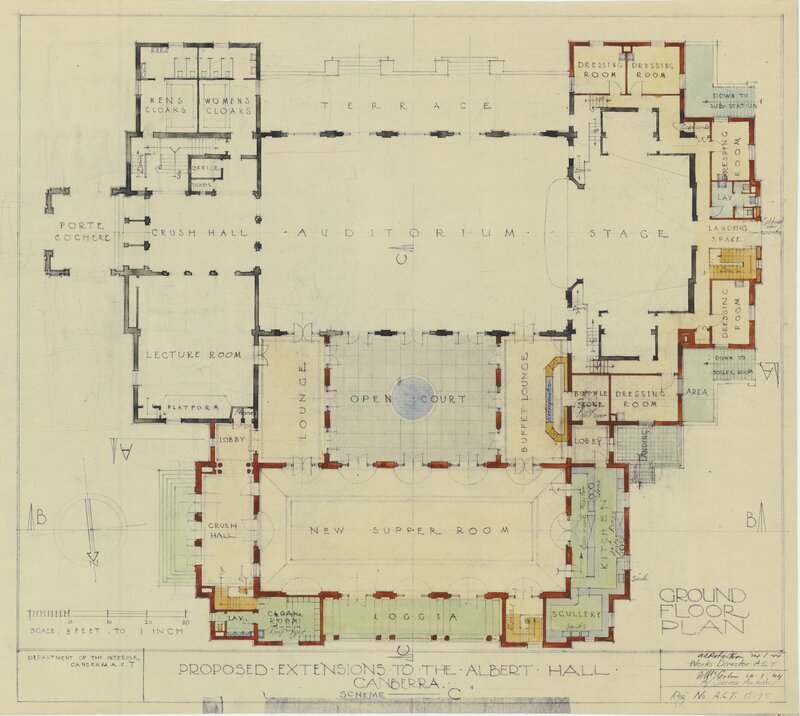 It seems that the advent of the Second World War quashed further discussion of renovations by the Committee although a set of ‘Scheme C’ plans were produced in January 1944. This much more elaborate addition to the northern side of the Hall incorporated two lounges and a large ‘supper room’. It was not until ten years later during the Committee’s 80th meeting in August 1949 that the topic was again raised. The latest plan produced (ACT 18600) "contained more elaborated proposals than were agreed to", and the Committee commented that "provision had been made for a sliding roof over the open court between the Supper Room and the main building. 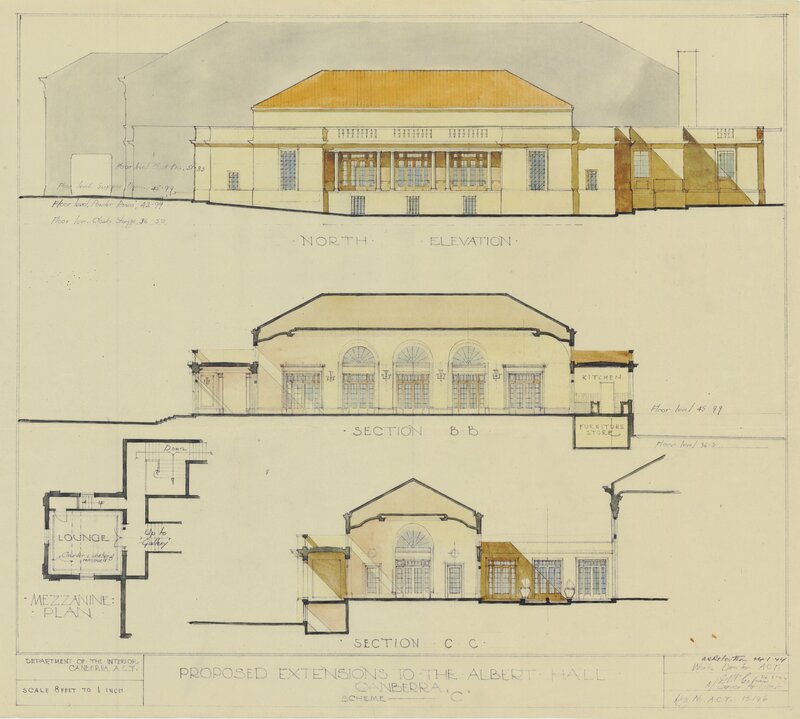 "(2) Unfortunately these plans have not been identified amongst the ACT’s archives. The NCPDC further discussed extensions to the Albert Hall in March the following year. By this time a new set of plans had been drawn. These plans abandoned the new Supper Room and Lounges "and provided for a less extensive scheme by a symmetrical extension on each side of the building incorporating the terraces." There had been objections to the earlier approved designs "in view of the unbalanced nature of the building"(3) as well as the considerable cost, estimated at £50,000. 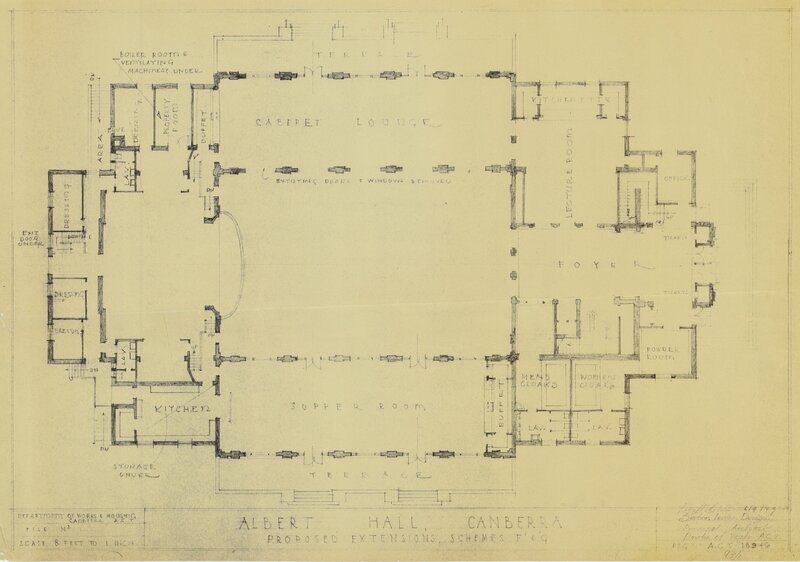 The final time the NCPDC discussed possible extensions to the Albert Hall was in April 1950, with the submission of another new set of plans. By this time the plan was once again an extension on just the northern side of the Albert Hall. Members had a number of comments on the design, including that "there appeared to be too many [doorways] for the small area" in the entrance hall, and "the ticket office might be of a portable nature. "(4) History tells us that these extensions did not go ahead leaving the Albert Hall in its original configuration. 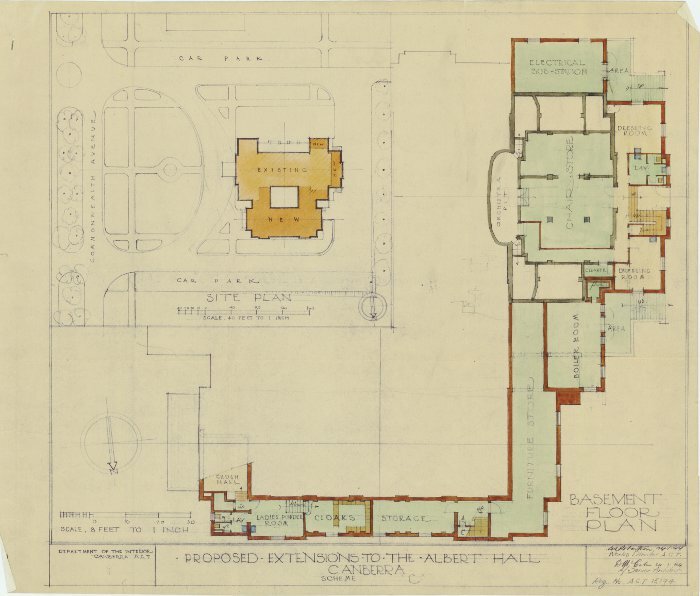 Although it was thought too small almost from the time of its opening, there never seemed to be the money available to pursue the many plans– grand or otherwise – to make substantial changes. It is interesting to contemplate how the Albert Hall’s heritage value would have been viewed if the substantial extensions had progressed beyond the planning stage, and what influence this would have had on the development of the Canberra Theatre and Civic Square. National Capital Planning and Development Committee ; Minutes of the Fourth Meeting Held at Canberra on Monday, 22nd May, 1939 – Page 1. National Capital Planning and Development Committee ; Minutes of the 80th Meeting Held in the Department of the Interior, Canberra on Wednesday and Thursday, 3rd and 4th August, 1949 – Pages 3, 4 and 15. 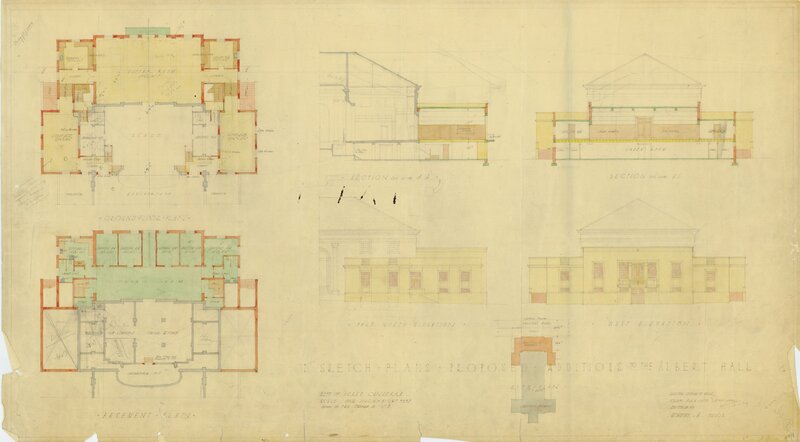 National Capital Planning and Development Committee ; Minutes of the 86th Meeting Held in the Department of the Interior, Canberra on Wednesday and Thursday, 1st and 2nd March, 1950 – Pages 7 and 8. 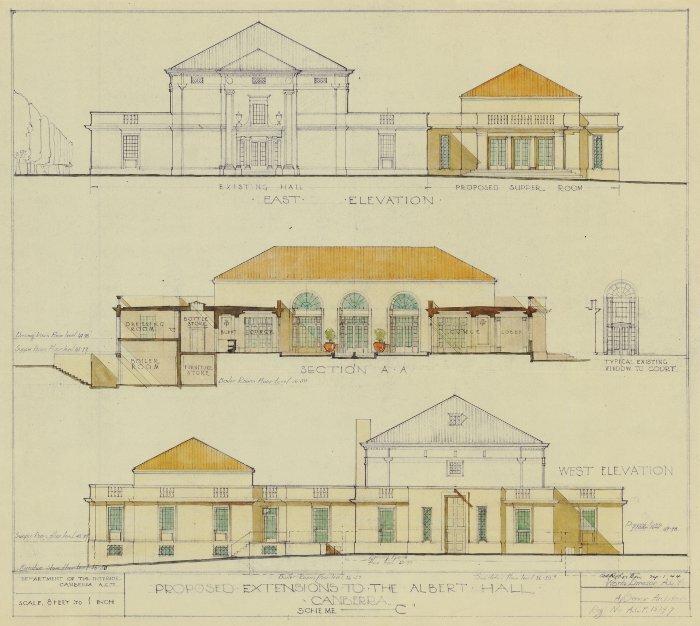 National Capital Planning and Development Committee ; Minutes of the 87th Meeting Held in the Department of the Interior, Canberra on Wednesday and Thursday, 12th and 13th April, 1950 – Pages 9 and 10.